Please encourage your students to sign up to help with the Open House. Student volunteers are needed from 9:00 am – 3:00 pm. There will be 2 training sessions: October 3 and 17. Students will be able to pick from X or Y sessions. 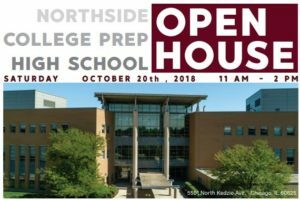 On the day of the Open House, students will show families around, answer questions, and have the opportunity to share what they love about Northside. Pizza and snacks will be provided and students will earn service learning hours. Please encourage students to fill out this FORM to sign up (accessible only via CPS login). We also need 100 adult volunteers to work this busy but super-fun event! Parents help answer questions and direct crowds in the gym, outside and all over the building. You will need to be registered as a Level II volunteer if you have not done so already. It very easy to do. Please see details below under CPS Volunteer Requirements. Sign up HERE to donate snacks for the students.